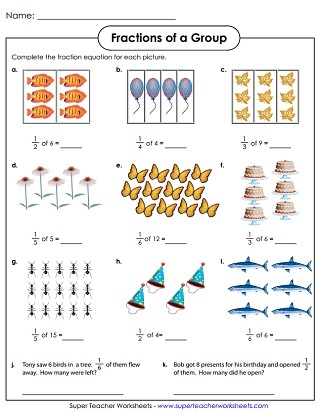 Find the fraction of each group; Includes only unit fractions; Easier version (example: 1/5 of 15). Color fractions of each group of marbles; Includes unit fractions only; Easier version (example: 1/3 of 21). Find the fraction of each group; Harder version (example: 3/7 of 28). Color fractions of each group of marbles; Harder version (example: 4/7 of 21). 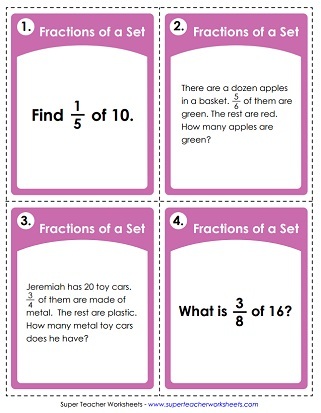 This file has 30 task cards with problems that require students to calculate fraction of a set. 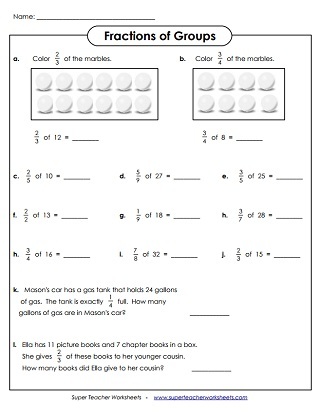 (example: 3/4 of 24). This section of the site covers equivalent fractions, simplifying fractions, mixed numbers, reciprocal fractions, adding and subtracting fractions, as well as multiplying and dividing fractions.